These guitar care tips will help keep your guitar in good playing condition. You should change your guitar strings when the sound becomes dull or the strings start building up dirt. When changing strings, clean off any dirt or grime that may have built up on the frets and fretboard. 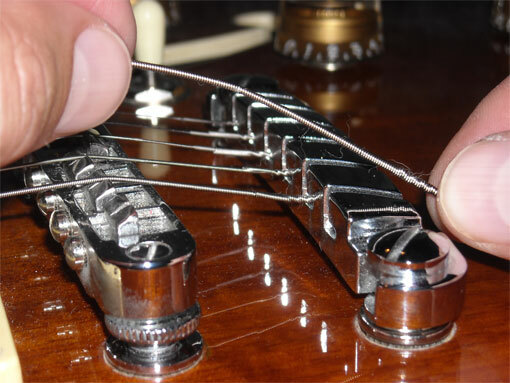 How to change Electric Guitar Strings. During a string change, clean off the fretboard of the guitar to get any grime or dirt off. Use fretboard oil or fingerboard oil to give the fretboard the moisture it needs as well as a popshed look. This oil is important to keep the wood of the fretboard from over drying and cracking. Rub the oil in evenly over the fretboard and let it sit a couple minutes. Wipe any excess off with a cloth. Guitars with finished maple fretboards, commonly on Fender Stratocaster and Telecaster necks, typically don't need conditioning since the finish seals the wood of the fretboard. A hard shell case is a good investment for any guitar, protecting it from falling, other accidents and weather elements. There are other types of guitar cases too, including cases made from a thin, pressed material (soft shell) or padded padded nylon (gig bag). Try to keep your guitar stored in its case or on a guitar stand so it doesn't fall over. Get a Guitar Humidifier for your guitar, especially acoustic guitars. There are different types available from humidifiers that are held between the strings inside the sound hole of an acoustic guitar, to guitar humidifiers you leave in the case. Guitar Humidifiers keep the wood of the guitar from drying out which leads to cracks in the wood and finish as well as other unwanted problems. Heat usually affects guitars more than cold. Try to keep your guitar in a temperature that is around room temperature. Keep your guitar away from windows, doors, heating and air conditioning ducts and vents, and anything that produces high or low temperatures. Guitars are made from wood which expands or shrinks slightly depending on the temperature and humidity where they are stored or exposed to. Try not to leave your guitar anywhere it will be exposed to hot or cold temperatures, like in a car or garage. If you have no choice, leave your guitar inside its case for a couple hours or as long as possible to allow it to adjust from being left in hot or cold weather. Intonate your guitar to stay in tune. When a guitar is properly intonated, it stays and plays in tune when you play in different positions on the neck of the guitar. The open strings of a guitar may be in tune, but if the intonation is off, the fretted notes higher on the neck will play out of tune. To check the intonation of a guitar, first use a tuner to tune each string normally. When the strings are in tune when played open, fret each string at the 12th fret and check to see if each string is still in tune. (You can also check the tuning of the harmonic tone at the 12th fret, but some guitar experts and luthiers disagree on the accuracy of this method.) Be sure to check each string of the guitar the same way, if the strings are in tune for each of these (open string, and fretted at the 12th fret) the guitar is properly intonated. Guitar pickups use magnets to turn the string vibrations into an electric current. The distance between the pickups and the strings is a factor in the guitar's sound output. If the pickups are positioned low and farther away from the strings, the output will sound lower. You can adjust your pickups to your liking by moving them closer to the strings to get more output. To do this, use a screw driver to raise or lower the pickups. Some guitarists have the pickups angled to create more output near the higher strings to even out the sound. Other guitarists raise the pickups as close to the strings as possible for higher output. Be sure not to raise the pickups too close to the strings as this may cause some unwanted sounds when palm muting.